At Dengie we are devoted to creating the best and healthiest horse feeds because we love your horse as much as you do. Our sales and nutritional teams are experienced and passionate horse owners and understand the many feeding challenges encountered today. Our sales team have a wide range of experience not just in sales and the equine industry. If you should have any queries about product availability near you or you would like to start stocking the Dengie range in your retail outlet then please do not heistate to contact your area sales manager. Our highly experienced and qualified nutrition team have are here to help answer your feeding queries and help to fine tune your horse or pony’s diet. If you would like our nutrition team to review your horse or pony’s diet click here to fill out a form to send to our team, who will in return put together a personalised feeding plan or alternatively call our friendly Feedline on 0845 345 5115* (Available Mon-Fri 9am – 5pm). Katie’s role combines technical support for customers and staff, product development, ensuring compliance with legislation and regulations and more recently, responsibility for Dengie’s environmental and social policies. Katie is ultimately responsible for the products and works very closely with the production and quality control teams. Tracey joined the Dengie team after completing her degree in Animal Science and Behaviour, which she shortly followed up with a MSc in Equine Science. Tracey has a wide range of knowledge of how Dengie is run having worked previously in the Sales Order Office prior to joining the nutrition team and taking on the responsibility of customer service. Claire’s interest in horses began at an early age leading her to follow a career in the equine industry and studying Equine Science to MSc. Claire specialises in nutrition for the performance and sport horse, advising our ambassadors and supported riders on the best Dengie fibre diet for their horses, helping to keep them looking and performing at their best. 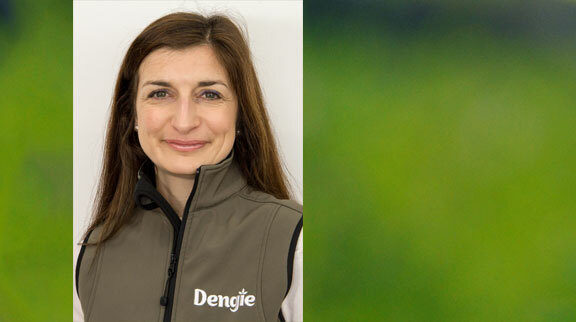 Polly joined the Dengie team in 2014 after completing a degree in Agriculture at the University of Reading. Polly’s role at Dengie involves answering the wide variety of feeding queries we receive on the feedline and website, tailoring diets for our customer’s horses and ponies. Polly also visits yards to advise horse owners and more recently advising on other species, such as alpacas! When growing up horses were always a part of Polly’s life and she still enjoys riding a friends horse today.